La Scena Musicale’s Dec/Jan issue returns to a bilingual format and is combined with the La SCENA arts magazine; two magazines in one. Our music cover features Canadian violinist Marc Djokic, winner of the 2017 Prix Goyer and new concertmaster of the McGill Chamber Orchestra. With the approaching holidays, we have articles devoted to holiday concerts, gift ideas, and a Guide to Winter Festivals. We also have a special section on philanthropy with articles on Guy Laliberté and the late Jacqueline Desmarais and Maurice Forget, and the Winter/Spring Social Calendar of Fundraisers. For our special arts issue on dance, organized by Nathalie De Han, La SCENA shines the spotlight on women in dance, highlighting the talent and work of seven brilliant choreographers in our section “Women and Dance: A Natural Alliance.” Choreographers Crystal Pite (on the cover), Helen Blackburn, Peggy Baker, Zab Maboungou, Helen Simard, Sandra Laronde and Antonija Livingstone discuss their respective approaches at the cutting edge of contemporary dance. We also look at the work of dancer, choreographer and baroque director Marie-Nathalie Lacoursière and dancer Céline Cassone. This issue continues La Scena’s all-colour, all-glossy format. Unfortunately, our recent applications for our fall issues for project grants from the Canada Council and the Quebec Arts Council (CALQ) were not successful and we had to postpone our special issue on choral music to November 2019. The global weakness in media advertising is also affecting our revenues. Hopefully, La Scena will be eligible for the recent funding announced by the federal government, who are encouraging media to turn to donations to fund independent journalism. Since 2001, La Scena has been recognized as a registered charity and all donations are gratefully acknowledged with a tax receipt. See page 19 for the list of our donors for 2017-18. We also take this opportunity to launch our year-end donation and subscription campaign. All subscribers get full translations in their choice of English or French, a gift CD, discounts on tickets, and a chance to win free concert tickets and recordings. This would make a great holiday gift for parents and grandparents or musicians and music students. See the subscription page on page 25. 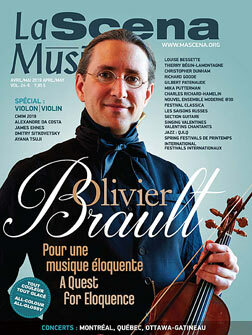 Beginning this month, La Scena Musicale will publish every two months. Your next issue will be out on Feb. 1 with a special on Contemporary Music, Film, Audio, Summer Camps and Wedding Music. The April/May issue will be devoted to the Violin and Visual Arts, while the June summer issue will be our national special on summer festivals. Keep on top of classical music news and events by visiting our website, mySCENA.org, for the daily news roundup and This Week in Montreal. You can like our Facebook page at www.facebook.com/LaScenaMusicale for daily updates, or sign up to for our weekly e-newsletter at enews@lascena.org for the latest news, promotions and contests. Have a great musical and artistic holiday season!